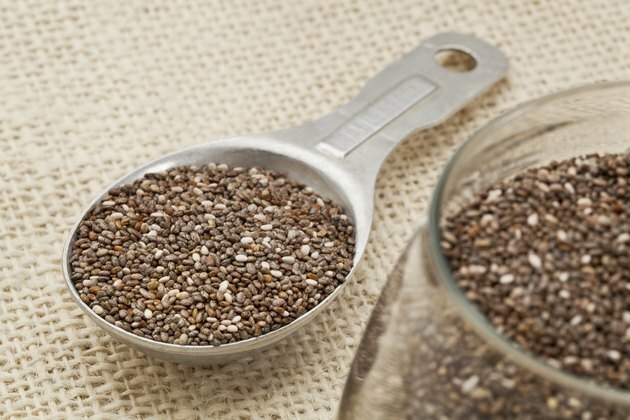 The calories in chia seeds are a bit high for a small, 1-tablespoon serving, but the health benefits are numerous. Most of the calories are from heart-healthy polyunsaturated, omega-3 and monounsaturated fatty acids, the kind that protect your heart. You'll get about 5 grams of fiber for bowel health, several key minerals for bone strength and all kinds of B vitamins to power your metabolism. To reap all the benefits, add chia seeds to a smoothie, stir them into your morning cereal or sprinkle them on your salad. A tablespoon of chia seeds, which weighs about 14 grams, contains approximately 70 calories. Nearly 40 of those calories, or 57 percent, come from fat. Another 9 calories, or nearly 14 percent of calories, are from protein. The final 20 calories, roughly 29 percent of the total, are from carbohydrates.